Despite getting stuck in the mud for an hour and a half at the start of our day on the Bolivian salt flats, our driver made sure we arrived in Uyuni on schedule at 3 PM. If the Immigration office was normally open on Sundays, it was closed by the time we arrived, so I had no choice but to spend the night in Uyuni and pay the $135 visa fee the next morning. Only then would the driver return my passport. I had two goals for the afternoon, and both were related to the persistent pain that continued to afflict all 10 of my fingertips. 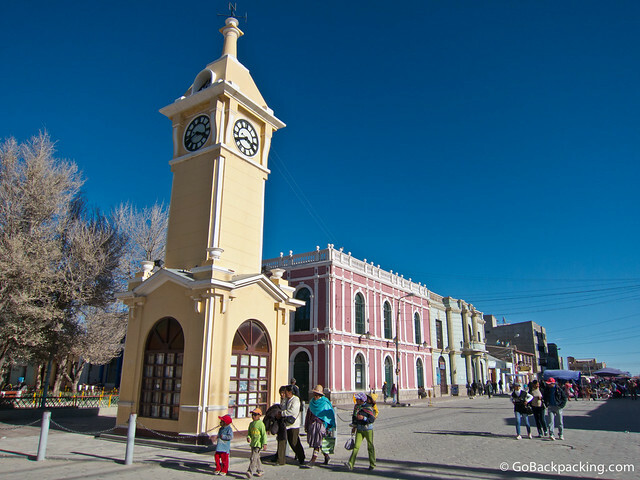 First, I needed to figure out the fastest way from Uyuni to Santa Cruz de la Sierra, Bolivia's largest city, and one of its lowest at 416 meters. I knew a significant reduction in elevation would alleviate the problem. And second, if possible, I wanted to see a doctor. I found a cheap hotel room near the city center, dropped my backpack, and went for a walk. There was a street fair in full swing, complete with a ferris wheel for the kids. Vendors were selling all sorts of street food, including chocolate-covered strawberries and candy apples. One of the hotels I'd looked at while searching for a room had a TAM flight schedule posted at the reception desk. Unfortunately, all the flights out of Uyuni to cities like Santa Cruz and Sucre weren't until Friday, and I had no intention of spending the week in Uyuni. The only flight out of Uyuni on that airline was to La Paz (3,640m), and that wasn't going to do me any good. I ran across another airline which did offer a flight direct to Santa Cruz Monday morning, and I paid around $80 to buy a ticket and confirm my spot. I figured it was better to be safe than sorry in terms of getting a seat on the flight. The alternative was traveling overland by bus which would take days. I also checked the bus schedule just to be safe. 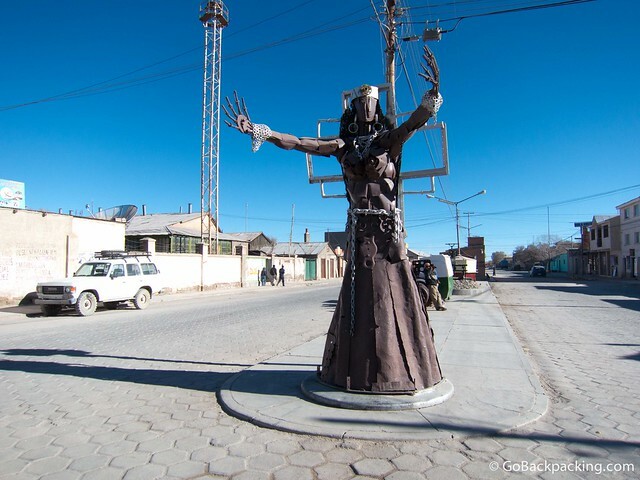 Here, there were at lot of options, including 9:30 AM and 10:30 AM buses direct to Potosi, the nearest big city and home to what was once the world's largest silver mine. But at an elevation of 4,000m, it would be taking my body in the wrong direction before I could get to Sucre (2,810m), and later Santa Cruz. Whether it was from walking around town on my own, or I had asked some locals to point me toward a clinic, I soon found myself sitting in a waiting room. The clinic was new, and still in the process of being set up. When the doctor was ready to see me, he took a brief history of my symptoms, and attached a blood-oxygen monitor to one of my fingers. At sea level, a normal blood-oxygen level is in the range of 95-100. At higher elevations, it's expected for it to be a little lower, because the air is thinner and there's less oxygen in it. I don't recall the exact figure, but it was clearly lower than it should've been. He advised me to get to a lower elevation, and prescribed two kinds of vitamins and Diamox. I was already familiar with Diamox from the research I did before trekking in Nepal. The drug helps the blood cells in your body carry more oxygen, and thus allows you to adapt to higher altitudes more quickly. I went to a pharmacy, and picked up all three recommendations, and began taking them immediately. Early that evening, I went out to dinner at a restaurant popular with tourists. There wasn't much else open given it was a Sunday. There weren't any tables available, so another solo traveler invited me to sit as his table. As we got to talking, it turned out he'd owned several skate shops in the northeast US, and that got us on a long conversation about skateboarding. It was random but cool to run into someone so familiar with the business aspect of skating, as well as many of the pro skaters I grew up with. My one and only night in Uyuni was not a good one. I was freezing cold in my room for much of the time, taking the blankets off the other bed to try to stay warm. I was up and awake early in the morning, hopeful that the Immigration office would open early enough that I'd be able to make my flight. But, it opened late, and by the time I paid my fee and got my passport back from the driver, there was little hope I'd catch my flight. 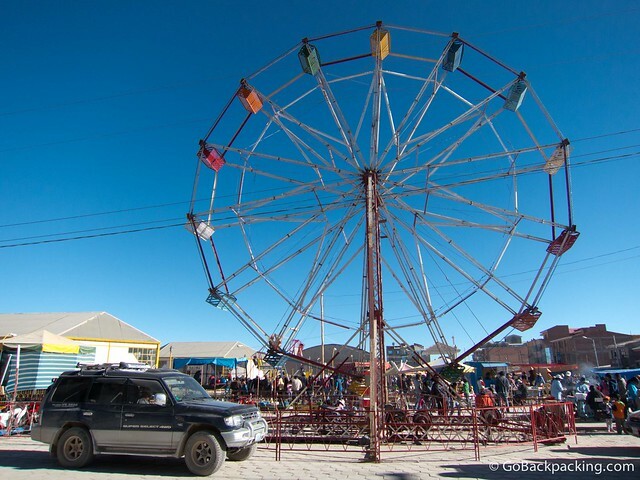 I tried anyways, paying a taxi to take me to the little Uyuni airport, but it was empty. The flight had left, and I had no choice but to travel overland. 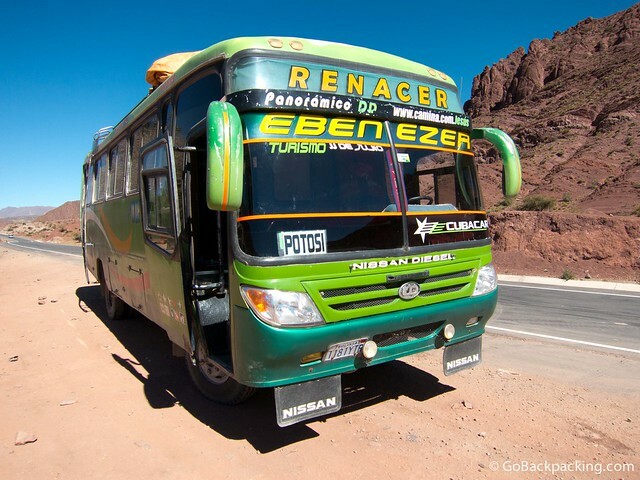 I paid 30 Bolivianos ($4.40) for the 10 AM bus to Potosi. The road out of Uyuni started off unpaved, but we soon hit fresh asphalt. If there was a silver lining in my day, it was the incredibly smooth highway that covered much of the distance between Uyuni and Potosi. It took five to six hours to reach Potosi, and by then it was 3 PM. I debated whether to push onward to Sucre. The truth was if I had to go through Potosi, I wanted to go on one of the infamous mining tours. I wasn't familiar with the details, other than I'd heard you could buy dynamite, and the tours involved going into real working mines. The chances of me ever coming back to Potosi were slim to none, so I decided to roll the dice, spend the night and do the mine tour in the morning. The altitude killed me there, but it sure was worth it!